Learn a lot more about how to play the violin with good technique. Violins need a good case to protect them from daily wear and tear. Without a good case, your violin will become scratched, dented, cracked, or even broken beyond repair. The BAM France company offers an excellent line of cases to hold your violin and bows in a small, portable, and protective instrument bag. BAM violin cases come in two kinds of shapes: oblong and contoured. Most of their models come in the rectangular oblong shape, but a few are contoured to follow the shape of the violin (namely the Classic III, and the Hightech Slim, Contoured, and Overhead models). Oblong cases are rectangular with smoothed out corners. The main benefit to an oblong case is the amount of room it provides for storage. 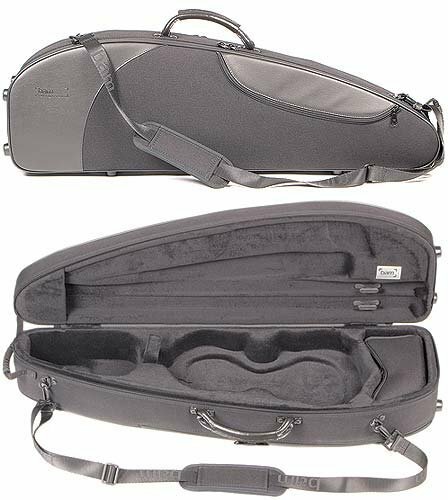 Many oblong violin cases have room for two or more bows, and also have accessory pockets to place the violin shoulder rest, rosin, or other extras. Their rectangular shape is fairly sturdy, and offers a nice cradle of protection for the violin. Contoured BAM cases offer the maximum protection with the minimum of materials. These shaped violin cases are lighter than their oblong counterparts, as they use less material. BAM's shaped cases still offer a good amount of storage space, though not quite as much as the oblong models. Their degree of protection is also considerably high, though they might not handle direct shocks as well as heavier cases. This is a tradeoff for a lighter case. Their cases also come in two kinds of materials, high density polyurethane foam, or the hightech AIREX and PVC plastic shell. BAM's standard cases are molded from high density foam, giving the violin a protective sheath of stiff foam insulation. The foam helps to offset changes in temperature and humidity. It's fairly rigid, and won't easily allow any shock to come to the instrument. The hightech BAM case line has a unique tri-ply layer of PVC and ABS plastic, as well as AIREX foam insulation. It's extremely lightweight and stiff, and offers an airtight seal to prevent normal weather changes from affecting the violin. Now that you have a basic idea of what a BAM case offers, let's take a look at the different models. 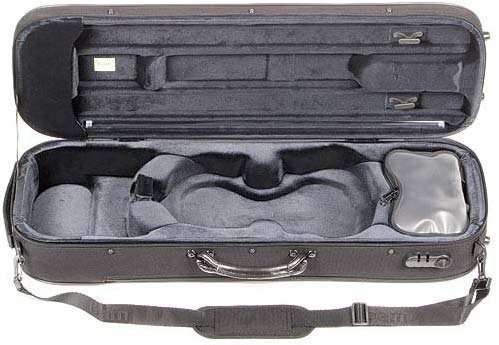 The France classic violin case is a good introduction to the features BAM cases have to offer. It is a contoured high density foam case that weighs just over six pounds. It has room for two bows and a shoulder rest. It comes with standard BAM shoulder straps that can be worn either over one shoulder or like a backpack. This case also has an expandable sheet music pocket to hold your music. Overall it's a good all around case for the student and professional alike. The BAM Stylus design offers a little more protection with an oblong high density foam case. It has a plywood reinforced frame to stiffen the outer case, and a full oblong construction keeps the violin centered when experiencing any shock or jostling. It too can carry two bows and a shoulder rest in addition to the violin itself. The outer case cover features a subway handle strap to carry the case vertically when it is not on your back or shoulder. There is no sheet music pocket, however. 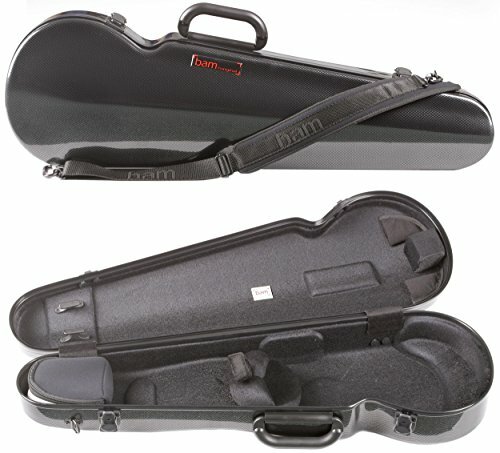 By far the most popular high tech BAM violin case, the Contoured AIREX/PVC plastic case offers superior shock and weather protection. The case is small and very light, less than three and a half pounds, which makes it extremely portable for traveling musicians. The rigid plastic exterior offers strong protection against knocks and bumps, while also adding an air-tight seal to resist weather changes. It comes with the same level of storage and straps that the previous two cases offer, two bows, shoulder rest, and two shoulder straps. There is no music pocket, which may necessitate a music carrying case in addition. This case is built to last. These three BAM cases give you an idea of the standard features and materials of the differet BAM product lines. Their other violin cases offer similar features with some variations. You need to find the one that best fits your own requirements for instrument protection, portability, and price. Good luck in your search for a great violin case.